Thank you all for your lovely comments on my last post. It means a lot to me to have your support. Still no news on going back to work. The union and the government have been negotiating all weekend but nothing has been reported yet. So I continue to keep busy and am trying to be positive. I finally put some trim on the last pillow I sewed up when I thought to myself, wow, I take a long time to finish my stitches. I should get more into the habit of finishing my projects right away instead of taking a long time to get them done! I hand sewing the cording to the pillow since I wouldn't have the first clue how to sew it with the machine. I like how I finished a February stitch in September...lol! Yes, I do take my time! Now I really need to work on my Christmas gifts instead of starting new projects, but hey, that's what stitching ADHD is all about. I decided to join Sarah and Lija in a Sheep Virtues SAL. Sunday is the post date but Mondays should be fine as well. The girls have all the charts, but I just have Love! So I began that on the weekend and managed to work on the border. The goal is to put in about 100 stitches in which I think I surpassed. 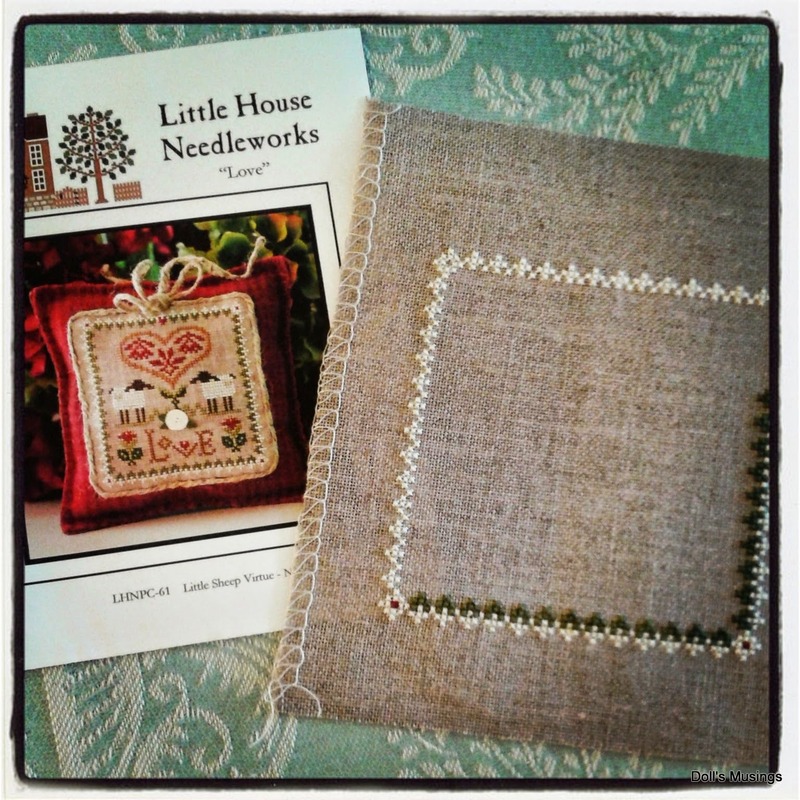 I'm stitching it on 40 ct. Natural linen with DMC threads. Made some more progress on Bitter Flower Sampler although somewhere along the way, the count is off on the top alphabet but I can't seem to find where I messed up. It doesn't make that big of a difference so I'm not worrying about it. Sarah Chapple's house is nearly completed. I have a bit more filling in to do then I'll be finishing the birds on the left tree and working more on the border. I was thinking back to when I last posted about my granny stripe blanket, and I think it was in May or June. Well, summer feels like it is still here, hot yet cool in the evenings. So I have been working away again on the stripes. I've also crocheted a little gift for my mom-in-law but I think she looks at my blog, so I can't post anything yet until she receives the package. Anywho, here's Granny! Those bright colours are going to be perfect to work with when the rain comes. Nothing like a bit of cheer inside when it's miserable outside! The other day we went down by the river and decided to try to fly our kites. With a lot of fiddling with string and sticks, we managed to get one of our kites up. You know the best kites are the dollar stores ones. The kites we've bought from shops tend to not fly very well and often break. Best to spend a dollar and not worry about loosing or breaking the kite. It looks so pretty against the azure sky. Speaking of blue, here's a winky photo of Titus blue eyes. Really not much else to report other than I am crossing my fingers and toes for a work resolution soon. Please pray for that! Lots of great pieces---you certainly have been busy! I love the trim on your little pillow! Hope that they can come up with a solution to end the strike. Lots of wonderful pieces you are working on, and that Cat, what a beauty. I guess the best we can say is that you've had a lot of time to do some pretty stitching and finishing! You are really productive on that score. Good tip about the kites. Who would think the cheapies work best. This strike as just got to end soon. I can't believe how long this has gone on. And neither can Titus by that look on his face! Gorgeous stitching :-D and your blanket lovely. Lovely finish and stitching . Your afghan looks amazing love the bright colours . I hope your job situation resolves very soon. 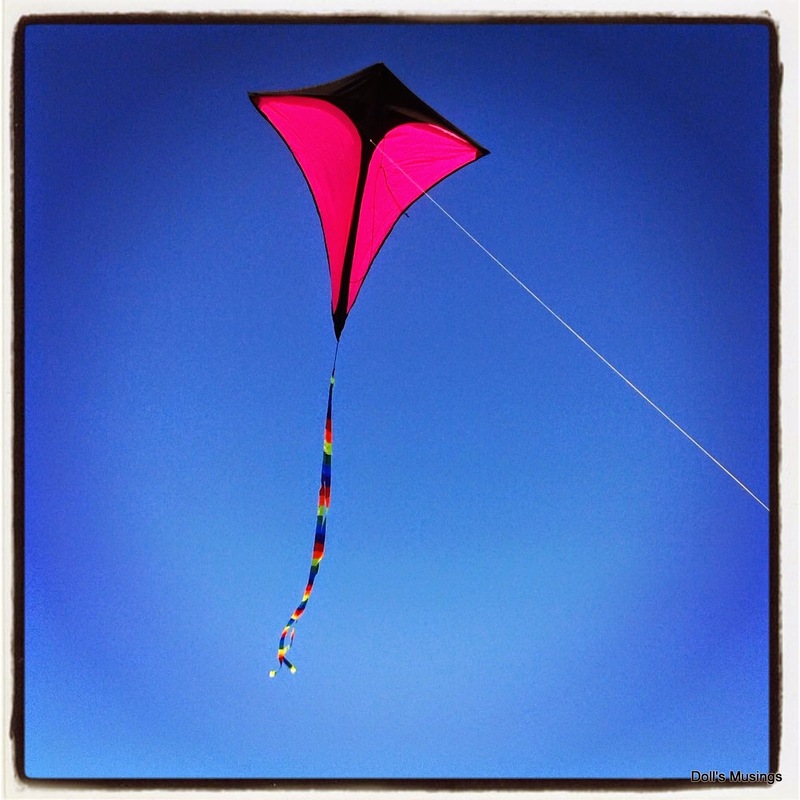 Lovely photos of Titus and the kite against the blue sky is just lovely. I've sent you an email about the Little Sheep charts, I hope you get it okay. Keeping my fingers crossed for you having the best result from the strike! 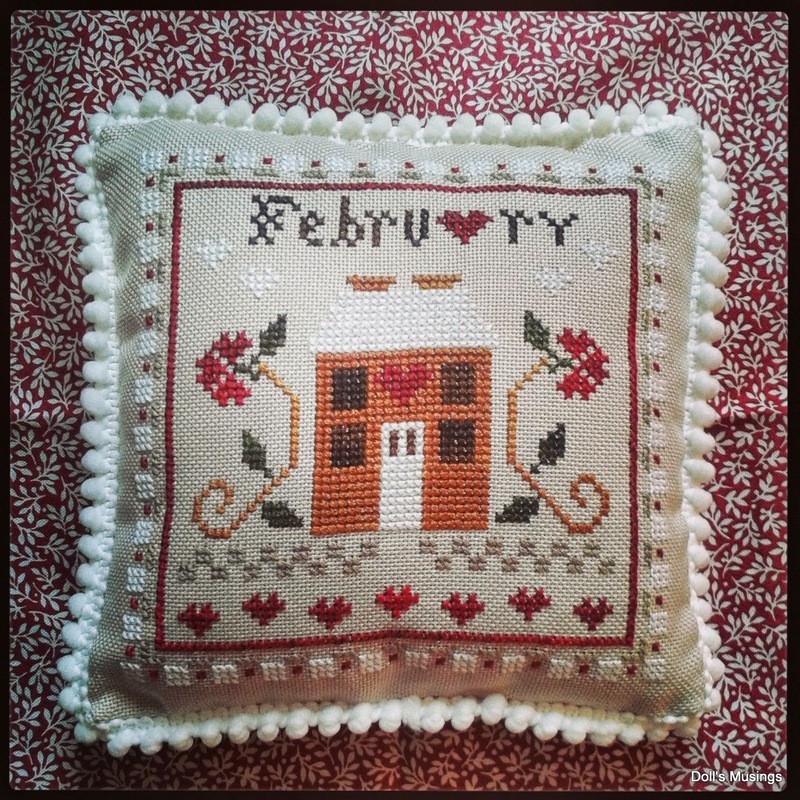 February pillow looks indeed so lovely! I liked your handmade sewing a lot! Great images and beautiful crafts! What could be more glorious?? Love your February finish. The edging is wonderful....I really must take a leaf out of your book and get on with my finishing! 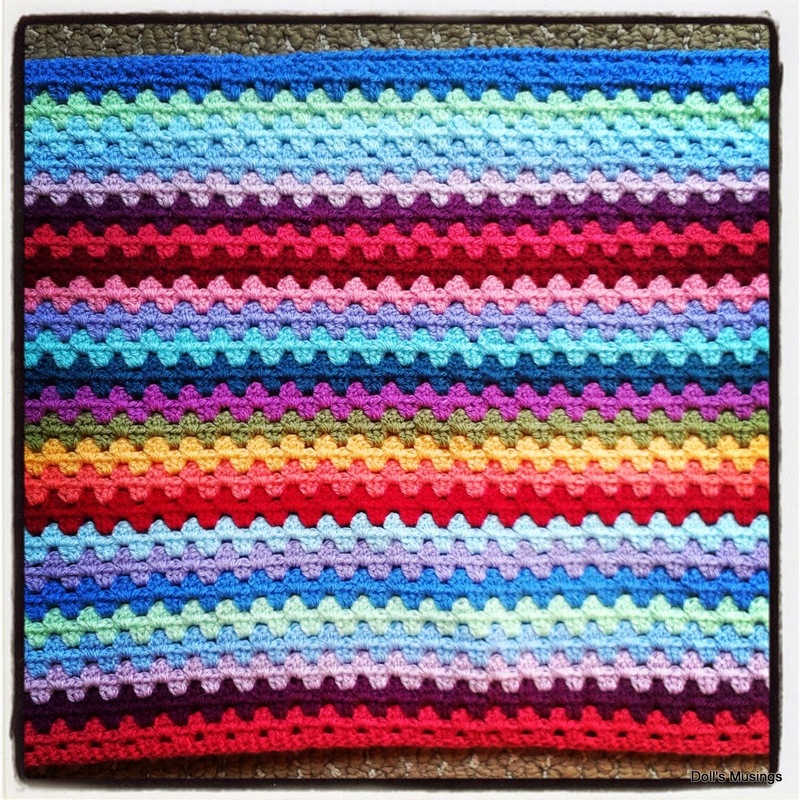 Those bright colours of your crochet blanket will definitely chase away the winter blues! Love all the stitching pictures. 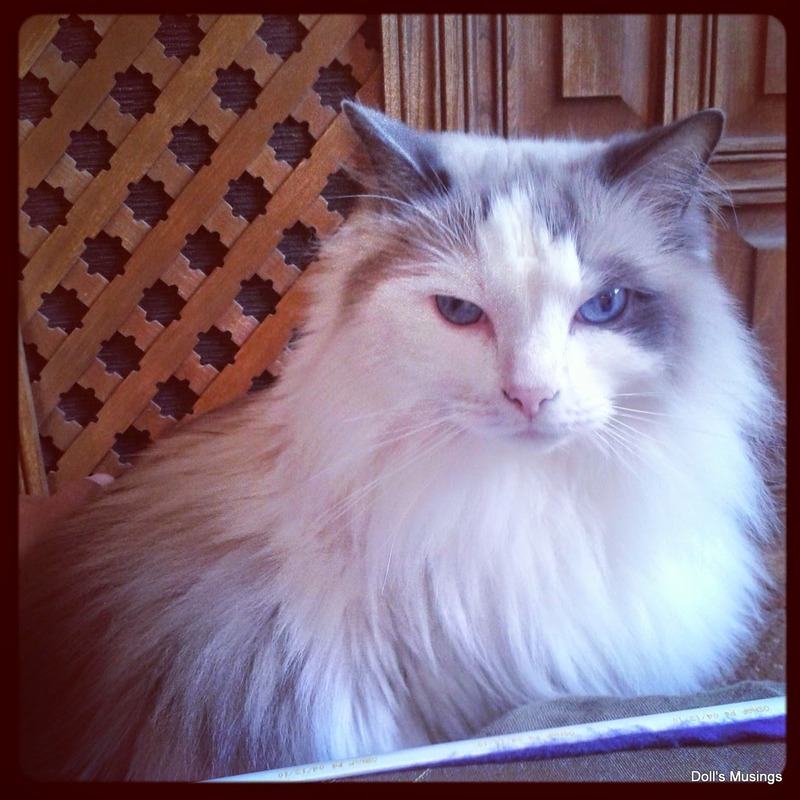 The furbaby is gorgeous....keeping my toes crossed...I need my fingers to stitch! Lovely stitching and finishing. I saw someone flying a kite on our local park last Sunday or rather trying to ... they weren't very successful! Beautiful sweet finish! I too stitch my trims by hand. Very lovely stitching on all your wips. Love Bitter Flower (looks great can't see no mistakes) and Sarah Chapple is gorgeous! Your crochet blanket is super pretty! Prayers for you and hope all works out. I just checked online and it looks like a tentative agreement has been reached with the teachers to vote on it on Thursday? I sure hope it works out, Anne--those children need to be back with their teachers and soon! 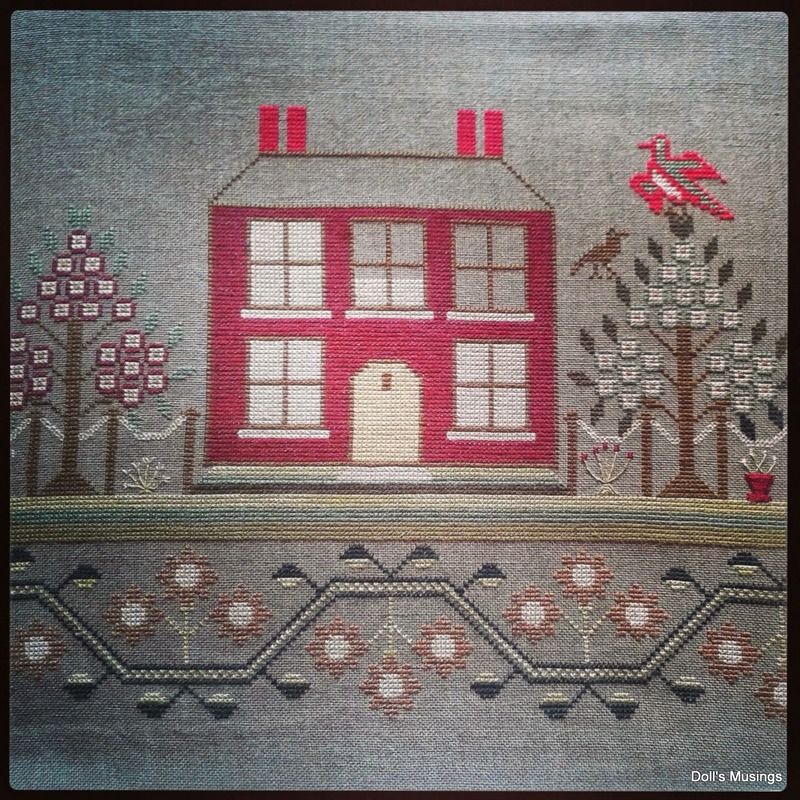 That is a lot of solid stitching on the red house, but sometimes it's nice just to do mindless stitches, isn't it? Toes are crossed for your job Anne. Love your granny stripe blanket. Your stitching and finishing are gorgeous. Wonderful stitching on all your progress. I can't see any mistake on the alphabet. Hope all resolves for you soon. Finishes are great whenever they're done. The granny quilt is perfect, great colors. Your little February pillow is so sweet with the trim. I tend to put off the actual finishing of things too. 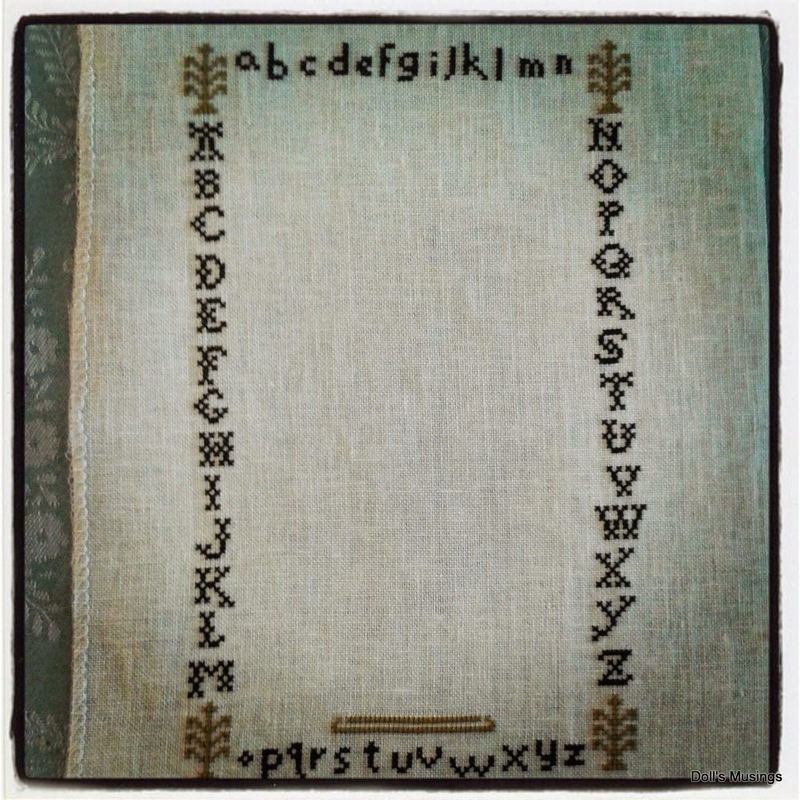 I love the sampler with the alphabet in the border, so much more fun that a repetitive border. I really hope they sort out this dispute soon, they are ruining so many lives delaying offering you all a decent settlement. Well, girlie, it sounds like you guys will be heading back to work soon. Fingers crossed. What a difference a day makes eh? Love your stitching but I especially love Sarah. She's a beauty and I still hope I will manage to stitch her one day when my stitching mojo returns! Great stitching and crocheting Anne! Love Sarah and the Little Sheep Virtues!I saw that you're going back to work on fb. That must be such a relief! Congrats! I hope the work situation gets resolved soon! Your projects all are fabulous. I hope your work situation improves! Thanks for joining the sal! and visiting my blog. It is always funner somehow to stitch with other people. I have some massive projects on the go with my sister. I have stitched 'Love' already ... it is one of my favourites from the series. I think Sarah only has two, and I need to buy another 4 charts to complete the collection. But that would go on Christmas wish list of suggested items to gift me. I can't believe I haven't bought anything cross stitch related since august. Maybe the issue with finances would get me off the stash obsession. I just can't believe you are stitching on count 40. Mine is 35 and that is horrible. I have made a grave error in mine and its so much lower than it should be! I started with a snowflake and probably turned it upside down at some stage. Your other stitching is also gorgeous, and the finish is very neat ... my projects end up stored for years after completion! Lovely post, Anne, full of life, creativity and fun! I, too, am doing the Little Sheep Virtues SAL with the three of you - such fun! Still sending support your way - Solidarity between teachers! Bahaha you finish more stitching than I could ever hope to complete! Even when you take a while to finish-finish! Jealous! :D Your granny quilt is so cheerful too! I hope the government gets its act together; seems silly to not want to help out those who help the future generations. I'm keeping my fingers crossed you are back to school soon. Cute finish and your other projects are looking lovely.